No! Na! Nie! Nu! Niet! Ne! Mai! No matter what language you speak, saying no to others can be hard but it’s an important part of maximizing your personal productivity. Like most people, you may fear saying no makes you look selfish, rude or lazy, but saying yes to everything will leave you with too much to do and can distract you from what’s important. No one else is going to watch your schedule to make sure you’re investing your best time into your best activities. You’re not five anymore and as helpful as your spouse or friends may be, they are not responsible for making sure you’re meeting your potential either. You couldn’t pay them enough. You are the only person responsible for your productivity. I hear from business owners and entrepreneurs all the time how upset they are that other people are constantly dictating how they spend their time and bogging them down with meetings, interruptions, and busy work. They voice that they can’t do what matters to them the most because they feel they’re slaves to everyone else’s beckon call. The truth is no one is is responsible for creating your schedule except you. If you find yourself acquiescing to every request of your time, you are at fault but you can change your course! You just need to incorporate a short, little word into your vocabulary and use it as often as needed. Every day you need to choose which activities to engage in so you can stop being upset and start being more successful. Choosing to say yes to the path of maximizing your success often means saying no to other activities. Warren Buffett said, “The difference between successful people and unsuccessful people, is that really successful people say no to almost everything.” Learn to filter every opportunity through your definition of success so you can invest your time to focus on your highest value activities. It’s best to find a positive balance and not quit invaluable activities cold turkey. Ease in to the transition then build your way up to only agreeing to activities that add value to your life or help you accomplish your goals. Keep in mind that you may have other activities planned on your calendar already as well. When you say no to unimportant activities and tasks, think of it as saying a reaffirming yes to your important existing priorities. We know we can’t possibly do everything but admitting to others we can’t do everything is often difficult (at least I certainly feel that way). My husband has helped me start saying no more often. I have observed him being direct and having no issue with saying no, even without explanation. That is the part I have the most difficultly with and I’m sure many of you do too. Without fail, I always feel the need to explain myself and justify why I am saying no. My husband recently asked, “Does explaining make you feel better or them?” After pondering his question for a moment, I realized that it probably just makes me feel better because no matter what, they are only hearing that I said no. When it’s time to deliver the message, there are many ways you can politely and effectively get your point across. 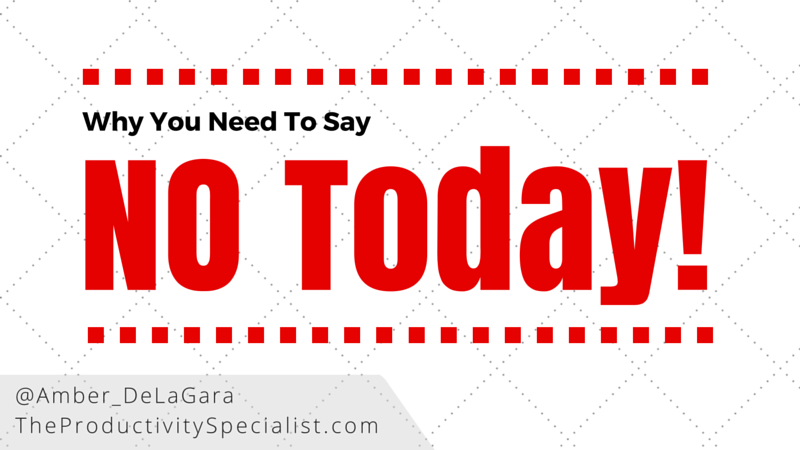 The simplest way is to just get it out with “No” or “Sorry, I can’t.” It’s important to be decisive about saying no. If you won’t be able to do whatever is being requested, don’t offer leeway by saying “I can’t today but another time,” or “Well, I’m busy right now but maybe later.” You would just be opening yourself up to having to say no again in the future. It’s best to be cordial and direct. You’ll be more respected for it at the end of the day. I recently realized that the way in which we say no is not as important as just saying no. If you don’t say no often enough to others’ requests of you, find your voice and a tone you are comfortable with and start saying no today! 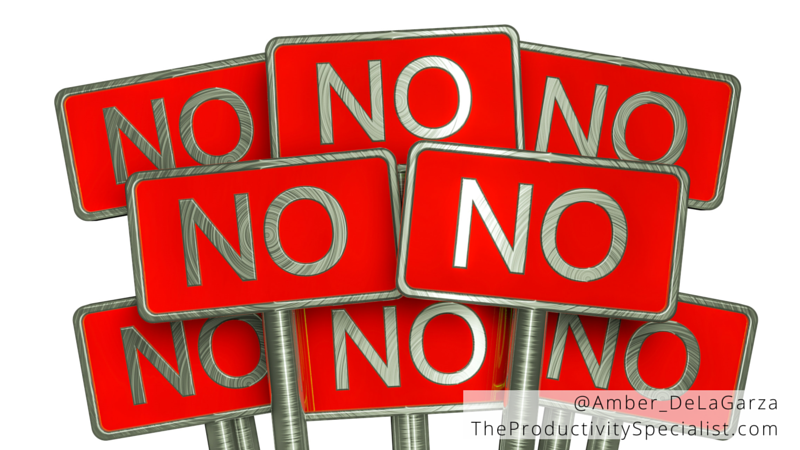 Following are some great resources by authors who share methods on how to say no. I urge you to take a look at the suggestions, try a couple out, and see what works for you. No one can be everything to everyone. Saying yes when you want to say no adds longterm stress to your already overworked body and brain. Saying no in any situation might bring on immediate stress but it will only last a short time and you will still reign over your schedule and feel more in control of your life. 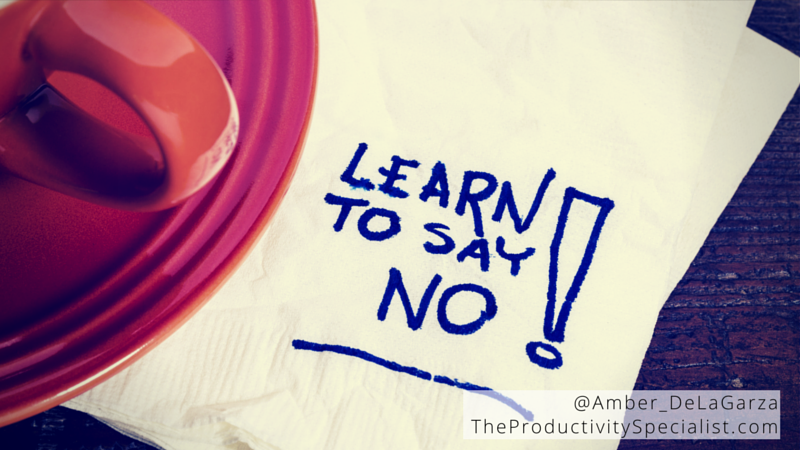 Learn to say no to activities that don’t add value to your life or serve your goal of being successful. It can be done but it takes commitment. Find a comfortable way you can deliver the message to others and stick to it. It will become easier and easier and you will find your calendar opening up to all sorts of free time to invest your best time into your best activities that you never knew you had! Commit to saying no to activities that don’t add value to your life or aid you in accomplishing your goals.